Sure, you both love exchanging gifts. But there's no reason his gift can't benefit you, too! The holidays are here again. It's time to start receiving, er...giving. Now, you can do both at once. These 9 romantic gifts, including everything from TiVo's magical new DVRs to the comfiest leather chair in existence, may seem like they're for your man, but really (let's face it), they're pretty great for you too. 2. Pasta maker: If you gift him a pasta maker, he will make you (finally, maybe) that famous homemade pasta about which he so bragged when he was still trying to impress you. And hey, if he doesn’t, it’ll sure make for a fun date night ($79.95, williams-sonoma.com). 3. Custom state silhouette: You love him, but if you have to spend one more night in his apartment looking at that “College” poster, you may just lose it. Treat your relationship to a little redecorating. This custom state silhouette is a great way to help him, uh, graduate to more attractive home decor. 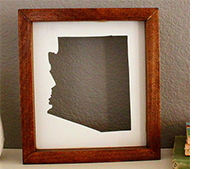 It celebrates his home state, and the wood frame has a manly feel, but you'll also like looking at it and, hey, if you moved in together, you wouldn’t hate having this in your place ($38, scoutmob.com). 4. Film movement: Movie night just got a whole lot better. No longer will you argue over whether you’ll watch his action flick or your rom-com. Film Movement can choose for you. The film-of-the-month club sources critically acclaimed indie and foreign films. Gift him a subscription and he’ll receive a new film each month, with one short and one award-winning feature length movie. You can also add streaming so that you two can access the complete library whenever you choose (from $29.95, filmmovement.com).